Riggi Paving Inc. is a family owned and operated company that has been serving northern New Jersey since 1958. Today, Riggi Paving Continues to provide the highest quality work thanks to Frank S. Riggi Jr. In a world where many companies just want to make a quick dollar, Frank Jr. refuses to concede to such low standards. He consistently maintains a level of integrity thats comes from a lifetime of learning and understanding just how important it is to perform your best when your name is attached to the job. A strong sense of pride accompanies Frank Jr., along with a dedicated crew, who he works alongside on all projects. 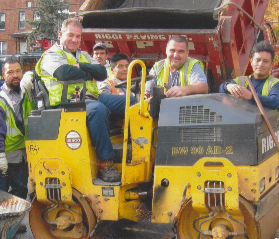 The crew has been working with Riggi Paving for well over two decades. Frank Jr. has been able to combine all of his old school teachings with decades of experience and the latest paving equipment and techonolgy available. Defintely a winning combination for continued success.